Guardians Of The Galaxy Vol. 2: Has Ego's Planet Been Identified? Guardians Of The Galaxy Vol. 2: Has Ego’s Planet Been Identified? Eagle-eyed viewers claim to have identified the shape and design of Ego, the Living Planet as he’ll appear in Guardians of the Galaxy Vol. 2 – and no, we’re not referring to Kurt Russell and his dashing beard, but rather the celestial body that gives the ancient deity its name. 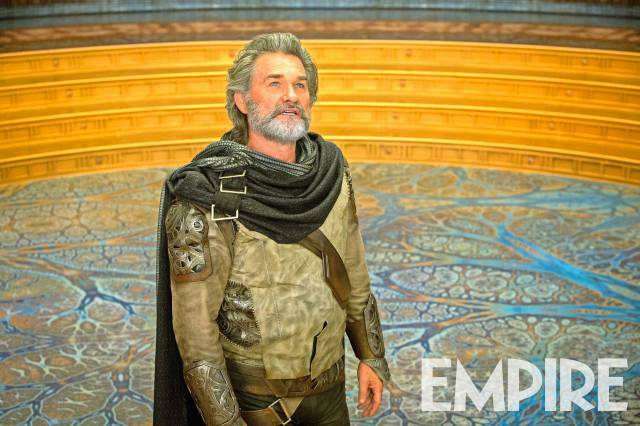 It’s been only 24 hours since Empire lifted the lid on a trio of pics for Guardians 2, one of which features Russell’s Ego in human form (see below), decked out in some fancy attire. According to a new report collated by /Film, though, there’s more here than meets the eye. First and foremost, it’s important to remember James Gunn’s recent interview concerning the actual design of Ego, the Living Planet, and how it resulted in the VFX team rendering what is supposedly the “biggest visual effect of all time.” Gunn didn’t do so alone, however, as Marvel drafted in renown fractal artist Hal Tenny to help visualize Ego’s otherworldly form. Birth.Movies.Death followed up on that revelation and uncovered some of Tenny’s intriguing artwork, before comparing it to some of the sci-fi environments populating the current onslaught of trailers and TV spots for Guardians of the Galaxy Vol. 2. Before delving into that particular can of worms, though, it’s important for Tenny to clarify his involvement in the Marvel sequel. I do want to stress that I only supplied fractal images and some models as concepts. I had no input what so ever on how the imagery was used, and for the most part any fractal imagery you see in the film has been further ‘conceptualized’ by other artists. For instance, a scene that shows fractal elements will most likely have been constructed from parts or pieces of many different fractal images I sent rather than a standalone fractal image. Pretty neat, right? Perhaps most intriguing of all, though, is that these designs are woven into Ego’s human costume, and if you peer close enough you’ll see tiny interlocking mechanisms stitched onto his jacket. Going one step further, the report asserts that Ego’s planet has already cropped up in the Guardians of the Galaxy Vol. 2 teasers, and there’s even one scene that features Star-Lord and the rest of the gang exploring its gargantuan innards. All of this is yet to be confirmed, of course, but take a peek at the second picture below and see for yourself. It certainly aligns with Tenny’s fractal art, no? Guardians of the Galaxy Vol. 2 blasts into US theaters on May 5th. Meanwhile, those across the UK and Ireland will be able to venture to their nearby cinema to catch Star-Lord’s next adventure from Friday, April 28th.